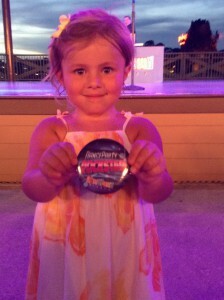 One of our adorable Petite Performer dancers had an extra special Disney vacation! She entered a dance off with over 1o0 other children and by the end of the final round she was announced as the WINNER! Congratulations to this little dancer…we can’t wait to see her winning dance moves in September! What did YOU do on your Summer Vacation TSPA Nation! Mollee Gray, of Teen Beach Movie, visited TSPA!